For many people who seek higher education in the United States, the common study period of two to four years is not enough. Luckily, graduate degree programs permit students to continue their education and become even more skilled in a given field. The highest level of education offered by an American college or university is a doctoral degree, or Ph.D. In science, technology engineering and mathematics, or STEM fields, it takes about five years of additional study to earn a Ph.D. In humanities fields, like history or language, receiving a doctoral degree takes an average of seven years. Doctoral degree programs are difficult and can be costly, but in the past they have been a path to a well-paying, meaningful career. A new study, however, finds that the number of people seeking Ph.D.s has decreased. Experts say the structure of the American higher education system could be the cause. 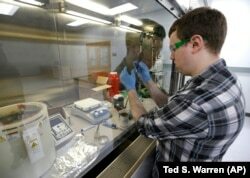 Caleb Ogier, a PhD student in mechanical engineering at the University of Washington, works in a fume hood with ink used to produce electrical circuits, at the newly opened Washington Clean Energy Testbeds laboratory. Every year, the National Science Foundation, the U.S. Education Department, and several other groups release a study on the number of research degrees earned in the U.S. The most recent study showed that the number of doctoral degrees fell to 54,664 in 2017 from 54,862 the year before. This may only be one percent decrease. But, the authors of the study expressed concern over what the decrease may mean for the future. Some experts argue that the latest information does not show important changes in U.S. higher education. Robert Townsend is the director of the offices of the American Academy of Arts and Sciences in Washington, DC. He said he would want to see several years of decreases before raising major concerns. Although the overall number of doctoral degrees decreased, he noted that is mainly because of differences in STEM fields and the humanities. In fact, the number of STEM Ph.D.’s increased. And as a growing number of people seek graduate degrees, many more companies are favoring those people for employment. Yet Townsend noted that the path most doctoral degree-holders take, once they complete their education, is changing. In the past, most doctoral students entered postdoctoral positions. In these positions, they would usually do research in their fields while also teaching. This has long been the first step toward being chosen for a tenured position, one in which a college or university offers a lifetime position for teaching and research. Townsend said, in the case of the humanities, this has changed over the last 30 years. There has been a move away from the humanities fields towards STEM fields because of the belief that they lead to better paying jobs. As a result, colleges and universities are employing fewer humanities professors. This can lead to more students reconsidering the long and costly road to a humanities Ph.D., Townsend added. And without a graduate degree, it may be harder for humanities students to demonstrate their abilities to employers outside of higher education. “We need to be doing a better job of helping our students understand that, as they’re getting a Ph.D., they’re not necessarily going to go into a career that will look like that of the person that’s teaching them,” he told VOA. Caitlin Cramer, a PhD student in materials science engineering, demonstrates a machine that can produce electrical circuits and solar cells at the newly opened Washington Clean Energy Testbeds laboratory at the University of Washington. Most colleges and universities cover a large part of the costs for students seeking STEM doctorates. But that does not mean there is less risk involved in investing so much time in your education, said John Walsh. Walsh is a professor of public policy at the Georgia Institute of Technology in Atlanta. He added that there are also some signs that STEM Ph.D.s may be losing their appeal, too. Walsh co-authored a study released in December on the amount of time scientists worked on publishing academic research. It examined the work of over 100,000 scientists who published studies between 1900 and 2015. The study found that, on average, it took about 35 years for half of a group of scientists in the 1960s to reach a point where they were no longer publishing academic research. By comparison, in the 2010s, it took an average of five years, for half of a group of scientists to stop publishing. The reason, Walsh said, was that many people are leaving research positions at colleges and universities. It is similar to the problem facing those in the humanities, said Walsh. There are fewer chances for growth. He noted that many research projects are much larger than they were in the past. Yet these projects are still usually only led by one researcher, usually a tenured professor, and they are the ones who get the most recognition for the work. The many post-doctoral researchers who help with these larger projects are highly skilled, Walsh said. However, they are less able to progress in their careers because they receive less attention. And their positions often only last for a few years. This means that they may have to move from project to project or even leave higher education completely. There have always been well-paying jobs for people with STEM Ph.D.s in private industry, he added. But failing to create special positions for researchers in higher education may push students away from seeking Ph.D.s in the first place. And having fewer academic researchers will harm the amount of important scientific discoveries coming from the United States. Pete Musto reported this story for VOA Learning English. Mario Ritter Jr. was the editor. We want to hear from you. How common is it for people in your country to seek a doctoral degree? Write to us in the Comments Section or on our Facebook page.